Carrying heavy loads of items now and then is acceptable, but if your work requires to transfer loads of bulk, then you should consider a hand pallet truck. This carrying tool can help you to transfer bulky items from one place to another without exerting much effort. Most warehouse owners tend to invest in a hand pallet truck because of the convenience that it provides. Hence, we’ve created a list of the top 10 best hand pallet trucks available in the market today. The following are the best models that you can choose from. It will help you to save both your time and money in the long run. You don’t need to burn a hole in your pocket to have a quality hand pallet truck when you can invest in this product. Introducing the mighty lift hand pallet truck that can accommodate up to 5,500 pounds of loads. This pallet truck is built to last and made of galvanized steel to survive even in a harsh environment. It’s an ideal choice for chemical factories and warehouses. It also features an overload release valve that will protect the pallet jack truck from overloading. The ergonomic handle with shock absorbing coating will ensure comfort while you are pushing or pulling the product. It also has high-tensile steel forks with extra reinforcements for tougher use. Weighing only 132 pounds, you can bring this hand pallet truck anywhere you want. 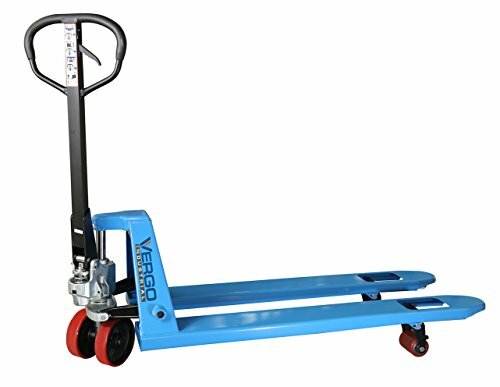 Next, we have the Vergo heavy pallet jack truck. This industrial and heavy-duty jack truck provides reinforced forks that make moving heavy loads a lot easier. It is also constructed with high-quality steel with a powder-coat finish that can last for a long time with proper care and maintenance. The pallet jack features a tapered design to ensure that entering and exiting the pallets can be done without difficulty. The oil-less bushings at key points will allow you to smoothen the operation and extend the life service of this pallet truck. To prevent the overloading, it has an overload valve on the pump. It’s also designed to increase the safe use of the pallet jack. To gain full control, you can adjust the lowering speed accordingly. 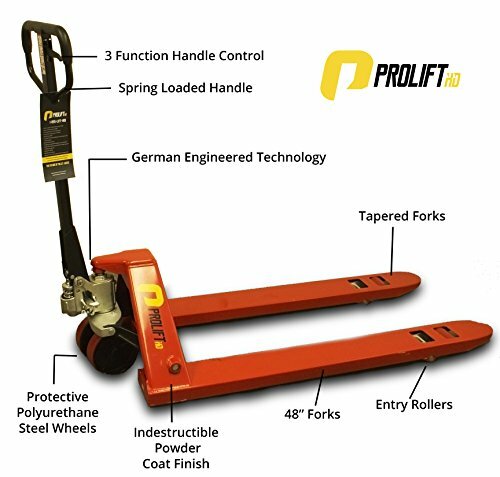 If you are on a budget, you might want to check out this heavy-duty industrial pallet truck from ProLiftHD. This pallet jack is intended for rugged construction and everyday use. It has entry rollers and tapered end to make pallet a lot easier. Rest assured that it can accommodate heavy loads thanks to its reinforced structure. You can choose between three function hand controls namely the raise, neutral, and lower. It also has an additional foot release, and its spring-loaded self-righting safety loop handle will provide optimal comfort and easiness of the operation. Rest assured that it can last for a long time thanks to its hardened piston with German engineered technology. The load wheels are made of non-marking polyurethane coated with indestructible powder finish. Lift-Rite Titan 5500-Lb. 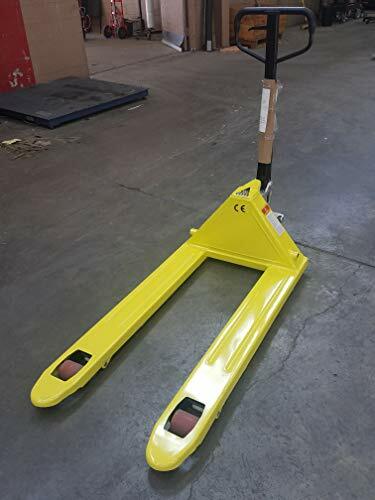 Capacity Pallet Truck - 27"W Forks - 48"
Next, we have the Titan pallet truck that can accommodate up to 5,500 pounds of heavy load. The package includes a loop handle with fingertips for optimal comfort when using the pallet truck. You can also choose from 3-position control (raise, neutral, and lower) for faster operation. There is also an entry slide bracket, sealed ball bearings, exit rollers, and adjustable push rods. Compared to the previous product, this model has an upgraded hard chrome-plated lift and pump pistons for optimal performance. Introducing the Global Industrial pallet truck with a 5,500-pound capacity. The item only weighs 163 pounds, allowing you to carry it where the work needs to be done. It does not only look stylish in orange, but it’s also highly functional. Standard features of a hand pallet jack such as exit rollers, composite wheels, and anti-slip grip are all present. This is also an excellent choice for those who are on a tight budget because of its affordable price. It is engineered for heavy-duty use, allowing you to transfer tons of bulky items every day without having to worry about the pallet jack breaking down. Check out this heavy-duty jack pallet that can accommodate up to 5,500 pounds in a lesser price. For those who wanted to save a few hundred dollars in a pallet jack, this is the best choice for you. The G941 is known for its durable yet affordable jack pallets. It features an ergonomic handle that won’t get uncomfortable even if you use it for extended hours. It’s designed to withstand rugged use in the warehouse or factory, and its wheels run smoothly against the cement or even pavement. 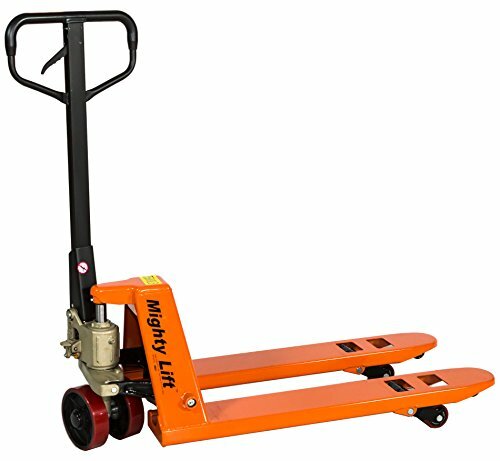 Another product from Mighty Lift is the heavy-duty jack truck featuring an ergonomic handle with shock absorbing coat for optimal comfort while using the carrying tool. This galvanized one-piece pallet jack truck pump is engineered for rugged use even in harsh environment. Lifting and lowering have never been easier with this high-quality jack pallet. To gain full control of the jack pallet, there is an integrated extra foot control to increase the efficiency of the product. We also like its extra ten grease fittings all over the pallet jack truck frame so you can easily lubricate the item when needed. It also features a release valve to prevent the tool from overloading. This pallet jack truck is made of polyurethane on steel to last for a long time with proper use and maintenance. 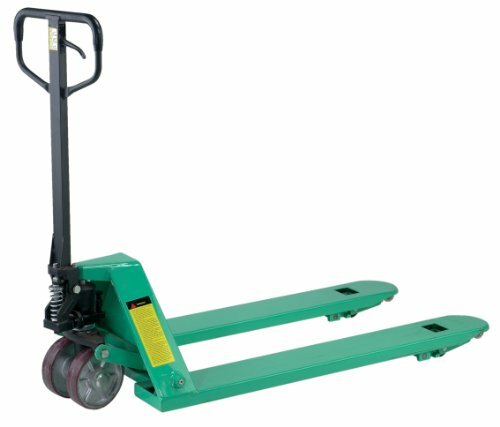 With over 5,500 pounds of load capacity, this jack truck is ideal for warehouse and factory use. Mighty Lift is best known for its durable jack trucks that can withstand rugged use in a regular basis. Similar to its other products, it also has an overload release to prevent the jack truck from overloading. The ergonomic handle has a shock absorbing coating to provide optimal comfort during the operation. It also has reinforced high-tensile forks with extra 15-inches to accommodate heavier items. You can also enjoy the ease of lubrication for this product thanks to its extra grease fittings. Next, we have the heavy-duty hand pallet truck from Crown. This hand pallet features an industry-leading quality, durability, and support. The parts are replaceable to ensure long-lasting service life, and you can find it easily in your nearest hardware stores. It features a 27-inch overall fork to accommodate heavier items. The 7-inch articulated wheels with 200-degree steering angle also help in running smoothly especially on cement and pavement. It’s a smart choice for pallet transport that pulls its weight for regular use. No need to assemble the product. It’s ready to use right outside the box. Buyers can enjoy 3-year warranty upon purchasing the product. Lastly, we’re going to feature a specialty trans roller pallet from Wesco. If you are willing to spend a few extra dollars, we recommend this carrying tool to you. This jack pallet is superior when it comes to durability and performance. It is made of steel to resist rust and corrosion in the long run and can accommodate up to 5,000 pounds. We also like its adjustable load wheels that will allow you to move the truck forward or sideways, giving you optimal control of the item. The handle is rubber-coated for grip, and the trigger on the handle will release and lower the fork when needed. Rest assured that the polyurethane wheels will not go flat and it’s resistant to wear and tear. The overload bypass valve is designed for the safety of the operator and also to avoid overloading the item. 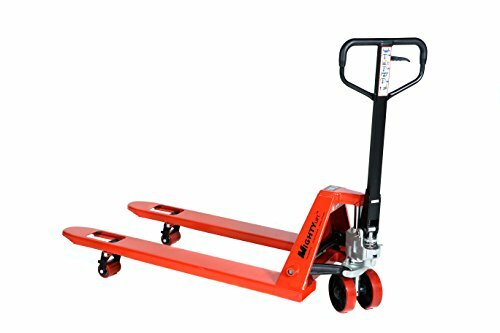 Hand pallet trucks are crucial in transferring heavy loads, especially in a warehouse. It is an integral tool that speeds up the process of loading and unloading items. Therefore, it is vital that you choose the best hand pallet truck for your needs. Before you browse the list of the best-selling hand pallet trucks in the market, below is a buying guide that can help you choose the right hand pallet truck to suit your needs. What are the Benefits of Using Hand Pallet Trucks? It helps to reduce accidents. Using a hand pallet trucks will help you to prevent accidents while at work. If done improperly, moving equipment could result in a severe injury. 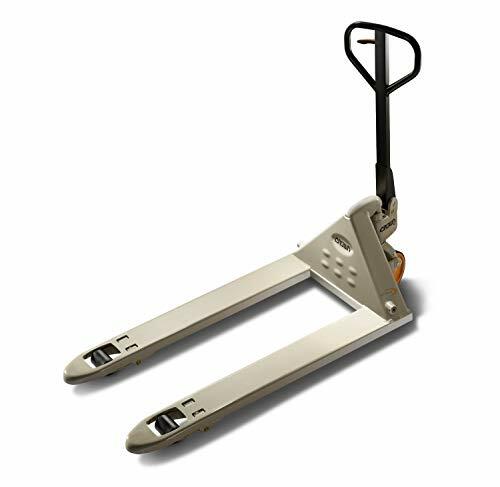 A hand pallet truck will allow you to move the heavy load material in ease. It is affordable. Another benefit that you should consider is its affordable price. 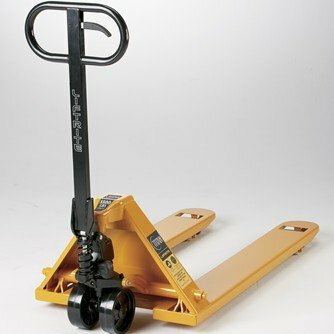 Compared to jack pallets, hand pallet trucks are affordable. It is ideal for customers on a tight budget. It is a versatile tool. Hand pallet trucks are available in all sizes, lengths, and styles. This is why it’s great to use in any manufacturing industries. A single tool can help you to finish a lot of tasks and speed up the process. Your hand pallet truck must be designed for heavy-duty use. You can tell by the materials used and its build quality. If you’re going to unload and load heavy loads of items regularly, your hand pallet must be able to accommodate the heavyweight every time. Most models of hand pallets are made of galvanized steel designed to last for a long time. The hand pallet truck must have an ergonomic handle. It must not cause fatigue to your hands when used for a prolonged period. Some models of hand pallet trucks have a rubberized and soft grip that contributes to the comfortability of the user when working with the tool. Some models also have a shock absorbing coating that can help you quickly pull and push the product. Another factor that you should consider, your hand pallet must have high load capacity. 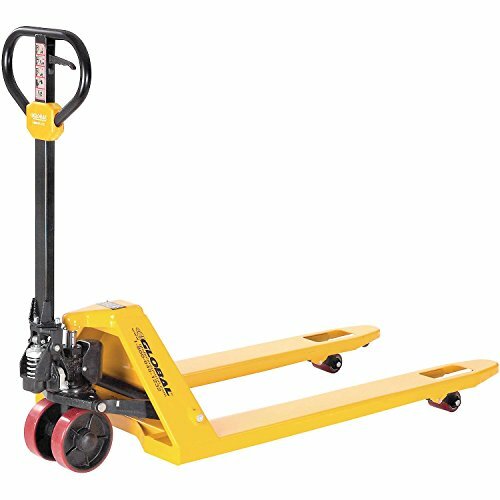 Standard hand pallet trucks can accommodate up to 5,500 pounds of loads. But if you transfer products that are heavier than that, you should opt for bigger sizes of hand pallet trucks to accommodate the weight that you need. Even if your hand pallet truck is designed for heavy-duty use, it doesn’t necessarily mean that it has to be heavy. You can have a hand pallet truck that is lightweight and portable, especially if you’re using the tools in other places aside from warehouse. It also makes it easier to use the tool. A compact and lightweight hand pallet truck is easy to store as well. To avoid leaking in your hand pallet truck, you must opt for a model with a built-in pump. These pumps are designed to prevent leaking when using the tool. The pump usually has an overload valve that will help you to avoid overloading the load capacity of your hand pallet truck. To ensure that you deliver the goods from one place to another safely, you should consider buying a hand pallet truck with a one-piece casting wheel. It helps to provide excellent stability when using the tool at work. Your hand pallet must be stable and able to hold your items properly to avoid accidents at work. The wheels of the hand pallet trucks must be composite and made of heavy-duty materials. In that way, even if you use the pallet truck in a rough cement, you can rest assured that it’ll be able to deliver the product smoothly. 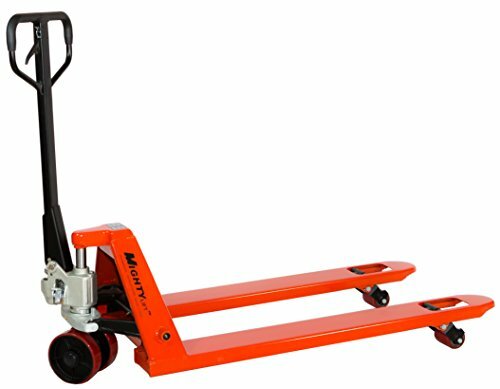 Also, when choosing the best hand pallet trucks, it is advisable that you select a model that has available replacement wheels for emergency purposes.